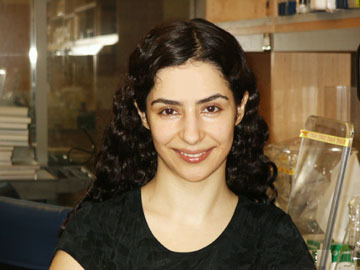 "Saba's discovery was akin to finding the Holy Grail of the splicing catalysis field," said Professor James L. Manley of Columbia University in New York City, who supervised her graduate work. "Obtaining catalytic activity from purified small nuclear RNAs had been attempted many times over the years in many of the major splicing labs around the world, which underscores the significance of her accomplishments." DNA, life's genetic blueprint, drives most modern biological events, along with proteins, and is generally considered the primary repository for genetic information. But, many scientists believe that DNA's modern-day messenger, RNA, played a far more dominant role in ages past, before handing over most of its biological functions to DNA and proteins. To rule the biological world, RNA needed to serve as an enzyme, capable of catalyzing a wide range of chemical reactions, explained Valadkhan, an Iranian-born scientist who is now an assistant professor in the Center for RNA Molecular Biology at Case Western Reserve University in Cleveland, Ohio. In fact, pre-messenger RNA splicing plays an important role in many aspects of cell growth control, differentiation and disease. This splicing reaction is catalyzed by the most complex cellular machine known, the spliceosome, a big ribonucleoprotein particle composed of some 300 proteins and five RNAs. But, where and how does the spliceosome's catalytic activity occur? For two decades, scientists had been investigating two of the spliceosome's small nuclear RNAs (snRNAs), called U2 and U6, as the most likely candidates-yet, without any proof, until Valadkhan's relentless quest for the answer. Her graduate research involved building the spliceosome's active site from scratch, by bringing together U2 and U6, then proving their catalytic action, by producing a novel RNA species, RNA X. More recent study has yielded another interesting product, RNA Y, which is still being characterized. Collectively, Valadkhan said, her findings "proved that the spliceosome is an RNA enzyme and a relic from the RNA world." Valadkhan "is an enormously talented young scientist with all the qualities-intelligence, dedication and imagination-that it takes to make significant and meaningful discoveries in the field of molecular biology," Manley said of his former student. "Strikingly, with careful planning, experimentation and persistence, Saba succeeded in establishing that purified U2 and U6 snRNAs do indeed have catalytic activity, and can promote a reaction related to the first step of splicing." While finally proving the catalytic potential of the two spliceosomal snRNAs, Valadkhan also developed a powerful new tool for further investigations of this crucial cellular machine and its evolution. 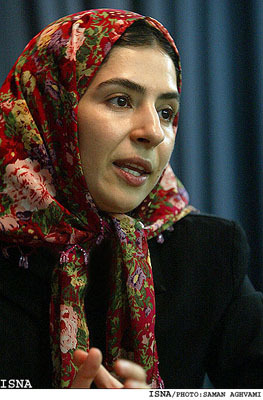 Born outside Tehran, Valadkhan's early studies focused on medical training, but she said that she switched to science partly in hopes of increasing the impacts of contributions. "If you want to have a real impact on healthcare, you can be a doctor and treat people, one by one," she said, "or you can become a scientist and make discoveries that could someday tell us something about disease, for example. So, I thought that I could potentially have an impact on many more people, as a scientist." Christoph Hergersberg, global technology leader of biosciences at GE Global Research, commented: "Saba Valadkhan's accomplishments are an inspiration to her peers, to senior scientists and to the next generation of investigators alike. Her work shows that the young scientists drive the progress. GE Healthcare is proud to support this progress through the Young Scientist Award." Donald Kennedy, Editor-in-Chief of Science, said: "Science is delighted to recognize Saba Valadkhan's outstanding contribution to molecular biology. Her discovery will benefit a generation of scientists investigating RNA and, in fact, the biological origins of life on Earth." Each year since 1994, the Young Scientist Award has recognized outstanding young molecular biologists at an early stage of their careers. Some 48 young scientists have so far received the award, honoring exceptional thesis work in the field of molecular biology. Applicants for the 2004 Young Scientist Award earned their Ph.D.s in 2003 and submitted a 1,000-word essay based on their dissertations. Their essays were judged on the quality of research and the applicants' ability to articulate how their work would contribute to the field of molecular biology, which investigates biological processes in terms of the physical and chemical properties of molecules in a cell. A judging panel selects the Young Scientist Award grand prize winner and may present regional awards in four geographic regions: North America, Europe, Japan and all other countries. These regional winners receive $5,000 awards. ���� ��� ������ �������� ������ ���Ԑ�� "Case western reserve"